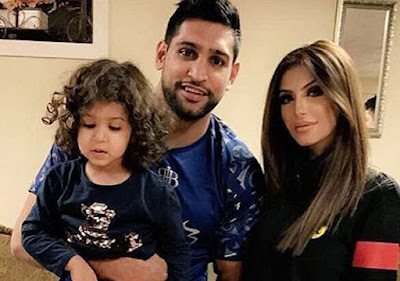 Amir Khan's estranged wife has hinted at a reconciliation with the boxer after claiming her daughter and unborn child do not deserve 'a broken home'. Faryal Makhdoom posted a lengthy message to Twitter in which she said it was time for her and Khan to put their 'differences behind us'. The pregnant model also apologised for all the 'infighting' between her and Khan's parents, which she revealed has had a 'terrible effect' on her marriage. Faryal tweeted the statement to her 180,000 followers just hours after announcing the launch of her own lipstick brand. She wrote: 'The past three months have been really tough on me and my marriage. 'Matters haven't been helped by the fact that my husband has been out of the ring for quite some time... it's been very stressful for us as a couple, and a family. 'I now recognise that all this infighting between me and my in-laws has had a terrible effect on my husband and I... and for that I would like to sincerely apologise. 'My mother and father-in-law are the elders of our family and as such deserve love and respect just as much as my own parents do. She added: 'My daughter and unborn child do not deserve a broken home. 'That is why I have decided that it is time to put our differences behind us, and start afresh.